Jeremy and I have been dabbling in the world of professional adventuring. Consorting with dwarves, smacking ogres around a bit, forcing our way into the troubles of a small village that is not what it seems. 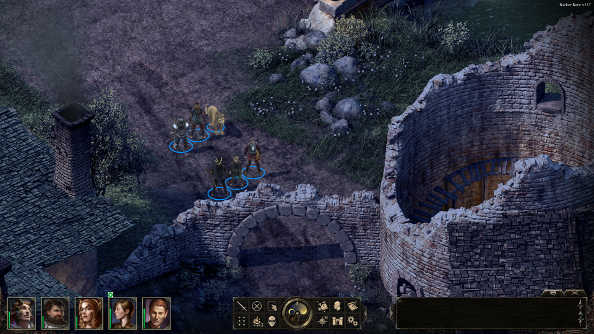 Obsidian’s Pillars of Eternity backers beta has allowed us to get up to all sorts of mischief and heroic deeds. But now we’re back in the warm embrace of an appropriately quaint rural tavern, sitting by the fire. Why don’t you come join us, as we veteran adventurers regale you with the stories of our journey. And maybe we’ll tell you what we think about the game, too. Jeremy: So, Baldur’s Gate Thr- ah, Pillars of Eternity. Quite good, innit? Fraser: I have also come to this conclusion! I’d go so far to say that it’s very good, even if it is a bit broken – as betas so often are – and held together with sellotape. Jeremy: It is one of those proper, unfinished betas. A smudged polaroid of the thing rather than the thing itself. But if you’ll excuse the abused metaphor, it’s the Nessie of polaroids – proof that a style of RPG we thought couldn’t exist anymore has returned to us. It really is Baldur’s Gate, isn’t it? Pedantically so – they even took the party movement cursor. Fraser: It is very Baldur’s Gate, with the stone and wood UI, painfully gorgeous backgrounds and long, drawn out conversations. But more than that, it’s very much like a tabletop game. Obsidian, I think, have done something quite clever by making the beta feel like a standalone adventure. It’s not the start of the game, there’s no waffling introduction or elaborate fate of the world quests – you just walk into a village, a troubled village, and see what shenanigans you can get up to. So it feels like an impromptu tabletop session with a bunch of mates. And that permeates throughout the beta, built into the very design of the game. I never felt like there was a Dungeon Master in Baldur’s Gate, for instance, but I do in Pillars of Eternity. There are quite a few moments where you’ll click on something, and then you’re treated to a page that’s almost torn out of a Choose Your Own Adventure romp, with an invisible narrator telling you what you see, and what you can do. Jeremy: I do love those Choose Your Own Adventure segments, with their muddy charcoal illustrations. What they signify, I hope, is Obsidian’s willingness to further the design ethos they once subscribed to at Black Isle. 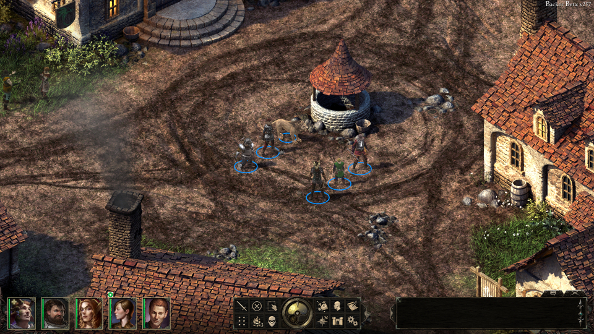 Almost all of the late ‘90s RPGs Pillars of Eternity emulates were guilty of sidelining character disciplines that didn’t slot neatly into combat or conversation. Dip your toe into Fallout’s character creation screen and you’ll bump into a handful of totally useless skills. Within minutes, by contrast, Eternity’s beta has you relying on abilities seasoned min-maxers are used to ignoring outright. After a tough scuffle with a rival party, I wound up smashing a quest item into pieces because my rogue wasn’t outdoorsy enough. Like you say, it’s that tabletop influence. Obsidian are finding new and better ways to extract inspiration from D&D. Fraser: When Pillars of Eternity and Torment: Tides of Numenera were announced, they were meant to be the successors to Baldur’s Gate and Planescape: Torment, respectively. After playing Pillars of Eternity for only a wee while, however, I started to notice that it draws as much from that plane-hopping adventure as the journey of the Bhaalspawn. Especially when it comes to conversation. I can’t recall a single chat that didn’t come with some sort of skill check or personality options. While investigating the vanishing of a young woman, I became very suspicious of a shopkeeper, a herbalist I think, because I thought she was holding back. But I didn’t have enough intellect to find out what she was hiding, and thus my investigation had to continue down a different path. So there are always different ways quests can play out, details you might miss because of your character’s stats, or because of the way you’ve chosen to portray them. Maybe you were too aggressive, where a diplomatic approach was called for. Or maybe you’re a bit thick. For all its similarities to these classic RPGs, though, it’s still very much its own game. The world is unique, even when it’s slightly familiar. What did you make of Dryford, the area most of the beta takes place in? Jeremy: At first, I felt like I was back on the Sword Coast. Baldur’s Gate might have been named after its singular metropolis, but it was really about the wilderness. Combat difficulty had something to do with it, but in BioWare’s first game it felt as if you were cast adrift in the forest with just a couple of health potions and a price on your head. Eternity by night feels much the same – especially with the deafening chorus of crickets all around. That ambience throws those relatively safe spaces, the hamlets, into sharp relief. Yellow warmth floods from the windows of Dryford’s sole inn, and the reassuring stench of tanned leather blankets everything. Or so the flavour text assures us, anyway. Eternity is infused with quiet literary touches, like the inn painting that turns out to be a crass political cartoon depicting two bitter enemies snogging. Dryford is a layered place – literally, as it turns out. Its denizens have small town concerns, but at least a couple unravel in conspiratorial fashion. How did you find it? Fraser: Perhaps it was my misspent youth reading old D&D source books and ridiculous R. A. Salvatore novels that ensured I’d feel completely at home in the Sword Coast, but despite the similarities, the world of Pillars of Eternity felt… fresh is the wrong word because this is a world with so much history, but very different. New to me, even though the world is old. You mentioned the Dryford Inn, and god do I love that place. One of the first things I did was strike up a conversation with a local storyteller, and for the next 10 minutes I gave him my full attention as he spoke of civil wars, rural strife, horrible lords and ladies – and all this lore was just for one crappy little backwater. By the time I stepped up to the bar to get pissed and find a room, my noggin was filled to the brim with places, people and words that I’d never heard before. And even when something sounds familiar, that doesn’t mean it is. You might recognise the name of a species of monster, but until you face them – or even chat to them – you don’t really know what they’re like in this world. This is a convenient segue into combat, because you get into quite a few scraps with monsters – and other things – in Pillars of Eternity. How did you get on with the violent side of things? Jeremy: I wasn’t the instant expert you might expect somebody weaned on Infinity Engine games to be, let’s put it that way. 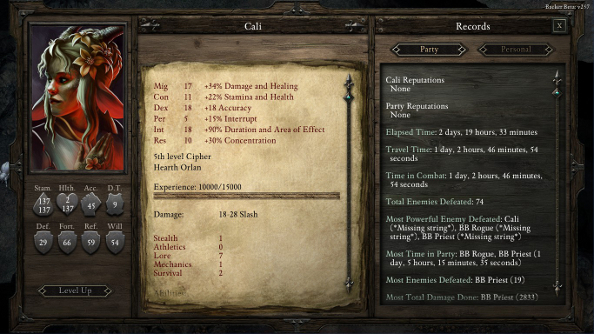 Eternity defaults to one notch below the difficulty it recommends for Baldur’s Gate and Icewind Dale veterans – but there’s nothing easy about picking up the reins of a stranger’s party midway through the game. It took plenty of poking at spells and some brutal orientation, but I began to enjoy combat deeply. Eternity requires one thumb to be constantly stationed above the space bar. No one enemy unit is to be underestimated, and so it becomes a matter of micromanagement: you’ll want to pause every few seconds to cast a fireball, pull a wheezing ally out of the fray, or simply check everybody’s doing alright. You come to appreciate the routine Infinity Engine satisfaction that is having your entire party flattened – and then making short work of the same fight with a bit of prep and regular recourse to the pause button. But it’s not all familiar, is it? It took me a couple of hours and a developer blog post to get my head around the stamina system. How did you find that? Fraser: Oh god, the stamina system. I was completely lost for a good long while. Splitting things up into health and stamina is really rather confusing, and since the beta drops you into the game without any guidance, it’s the source of a lot of deaths. But I grew to appreciate it, especially because it means that getting knocked out in combat doesn’t equate to death – it just means you get back up again after the battle, feeling a bit worse for wear. It’s actually a little like the Dragon Age system, where a KO leaves you injured, but not dead. Jeremy: Yeah. So here’s how I understand it: diminished stamina is the lion’s share of the damage enemies deal, and the only thing clerics are capable of topping up. Characters tend to fall unconscious long before they’re dead – and death is a far bigger deal (optionally turned off in the menu). It’s certainly not solvable with a late night dash to the nearest temple. Too much actual damage results in devastating wounds you’ll need time to recover from, and reinforces the role of inns like Dryford’s as anchors – the unavoidable full stops in your adventure. Sooner or later you’re going to need to head back to civilisation and get some proper kip. Fraser: I think that it’s really hard to judge the combat from the beta. You start at level five with a pre-made party, who all have these abilities and spells that you never selected. It’s decidedly awkward. And bloody hell, battles are quick, frantic affairs, weirdly juxtaposed to the importance of tactics and timing. Since spells take time to cast, it feels like the game expects you to know to use them before you need to, and I’ve not quite reached the point where I’m able to see into the future. Like you, my fingers never drifted far from the spacebar. I wonder if I would have been more comfortable with a turn-based system or even – like Arcanum – the option to use one or the other. On those occasions where I didn’t just run head first into a battle – something I’m guilty off too often – I did find that Pillars of Eternity rewards planning. It’s definitely tailored to commanders, who plan tactics and strategies in meticulous detail. But the beta makes that tough, because you’re playing with someone else’s toys, not ones you’ve made yourself, beyond the player character. Jeremy: Agreed. It’s worth noting that there’s a half-speed option in addition to the pause button. I discovered it by mapping scroll-down to the same key, and spending an hour thinking the game must have been optimised by the HR department. Fraser: There are some bugs, at least I hope they are bugs, that made combat a bit of a pain at times. Were you a victim of the terrible pathfinding system like I was? Not a fight went by without party members running into each other and getting stuck, unable to simply walk around another person. Jeremy: Ugh, yes. Somehow, the pathfinding is worse than that Black Isle put together in 1998. 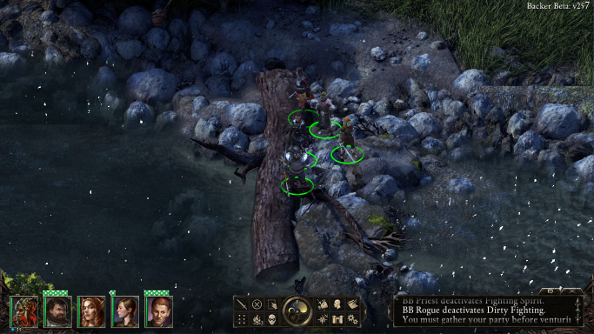 Party members – five of them, in the beta – bump up against each other, seemingly too polite to push past to their intended destination. And battles gone awry currently end in a bizarre whack-a-mole sequence. Whether it’s a beta concession or a result of the stamina system, downed characters tend to pop up again just as your last party member collapses, gasping, to the ground. Some bewildered cultist or giant spider then has to dash back and forth, poking the air out of your comrades until at length the game gives up and acknowledges that everyone is dead. Lockpicking, meanwhile, is a mystery to me and half of the official forums. But I expect that’ll all be dealt with by the end of the month, thanks to those same forumites. 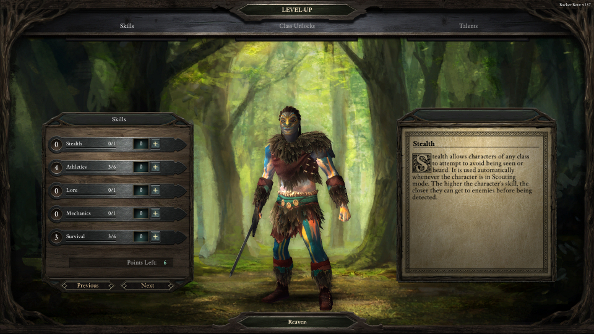 It’s a big ask, to see a sprawling, subtle RPG like this one in beta. Divinity: Original Sin was a knotted string of placeholder dialogue a year ago, and is now one of the finest examples of the genre. Isn’t that weird? Any other year and we’d be hailing Eternity as the only one of its kind. But especially now we know Torment will use Eternity’s engine, it feels as though we’re living through a second Infinity Engine age – brought on by Kickstarter. Fraser: It is undeniably a strange – and wonderful – time to be a lover of sprawling, tabletop-inspired RPGs. 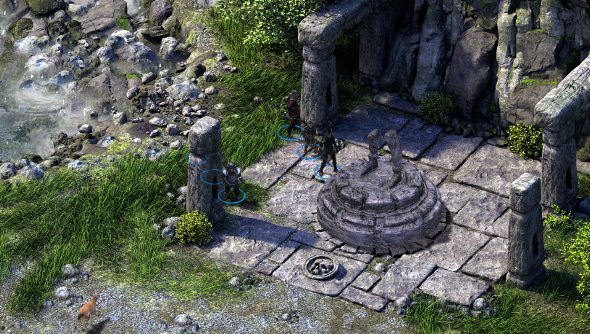 And despite the issues, expected issues, in the beta, looking past it I think it’s easy to see that the building blocks and Pillars of Eternity’s foundations are very, very solid. Obsidian is promising a lot, and this teaser already fulfils a lot of them, even when it’s a bit shaky. I’m sorely tempted to play more, to experiment with different classes – especially the Cipher, Pillars of Eternity’s weird telekinetic warrior – and try to get used to the combat more, but I also don’t want to spoil the main course. The beta has whet my appetite, but I think I’ll be taking a break from it so that I can properly devour it at launch.